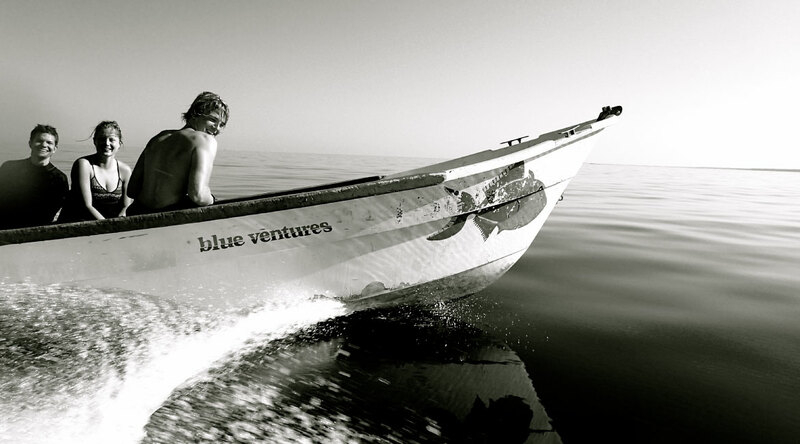 Never has there been a more exciting time to be a diver; liveaboards transport us around the world, remote reefs are accessible by mainstream tours and “unique” diving opportunities are as common as wrasse under a pier. We’ve been in search of the interesting stuff, we’ve looked under rocks in far off corners of the web to find the truly fascinating trips, expeditions and tours on offer and then we’ve asked our friends to give personal recommendations. Some of these trips are pricey, some are extreme and some are just plain fun, none of them are boring! Join a remote research and expedition camp in Madagascar and dive every day whilst working alongside an international team of marine biologists, field scientists and sociologists surveying one of the most spectacular ecosystems of the Indian Ocean. The research and conservation center is based in a small fishing village called Andavadoaka on the southwest coast of Madagascar, home to semi-nomadic communities known as Vezo or people of the sea. During these 6 week placement the first two weeks are spent on intensive science training which gives the skills and knowledge to carry out research dives. The training involves snorkelling and diving as well as informal lectures, small group discussions and practical exercises on coral and fish species identification. Whilst on research dives participants collect critical marine inventory data, which feed into published reports and scientific papers about the state of Madagascar’s coral reefs. Dive Level: no previous dive qualifications required on arrival but participants will be trained up to PADI Advanced level by the time they leave. Additional dive training available including up to Dive Master level on a ten week placement. Most divers have experienced nights dives but very few will have experienced night diving like this. Eight miles offshore, far from the reefs, above 1000m of dark water divers descend to a specially constructed rig of steel bars with underwater lights at both ends. The rig, which has been lowered into the water 30 minutes before the dive starts, will have attracted some of the ocean’s weirdest and most wonderful creatures to rise from the depths – from post-larval fish of many different species to cephalopods, jellyfish and crustaceans. Participants report this is initially an unsettling, senses going into overdrive, dive as beyond the boundaries of the lights the black of the deep oceans and the teeth it contains sends their imagination wild. 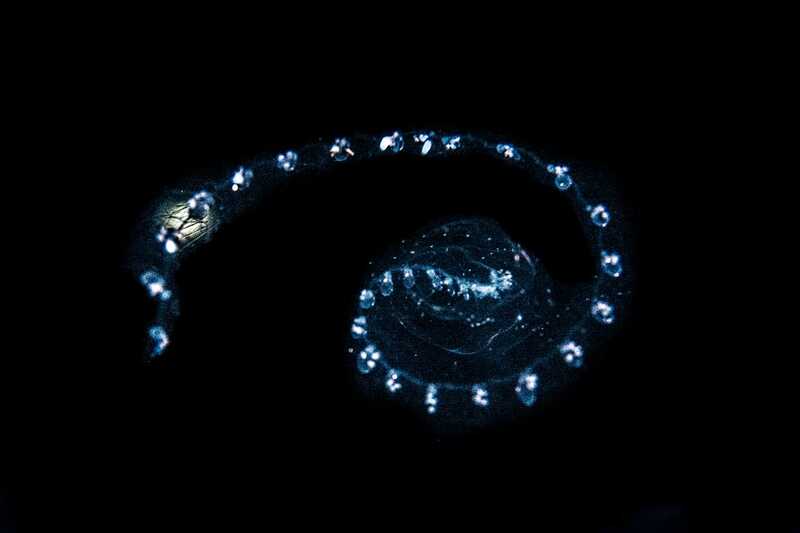 Gradually though the beauty of the glowing macro creatures and the speedy flights of pelagic squid and swarms of pulsing jellies moving into and out of the lights fascinate them and the fear is forgotten. Apparently a calm zen like feeling descends and divers report they feel as if they are having a truly alien encounter. Dive Level: all divers must have precious night diving experience and a minimum of 50 logged dives. 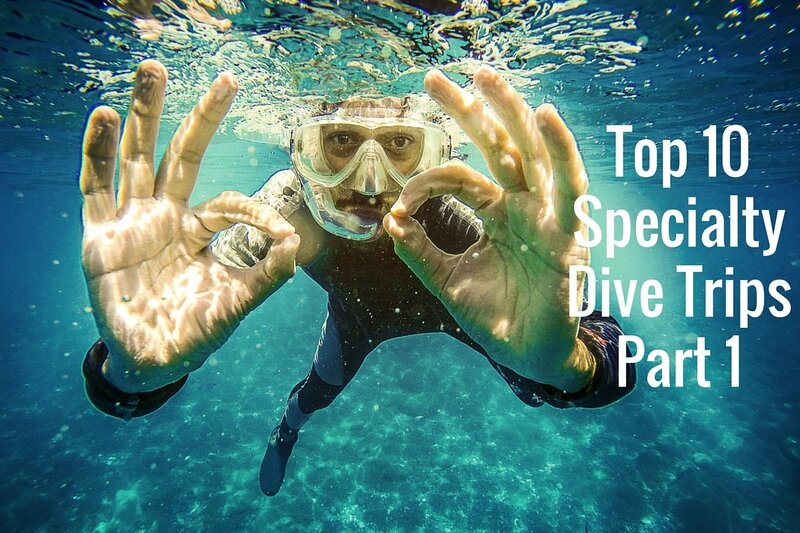 There is a maximum of four divers per trip. One of the great natural spectacles and normally invisible to all but a few this is the wild fish run, when the cold current turns off South Africa’s Eastern Cape Province and sweeps north, driving before it the sardines that have been breeding in vast numbers off the Aghules Banks and followed by every hungry predator in the sea. 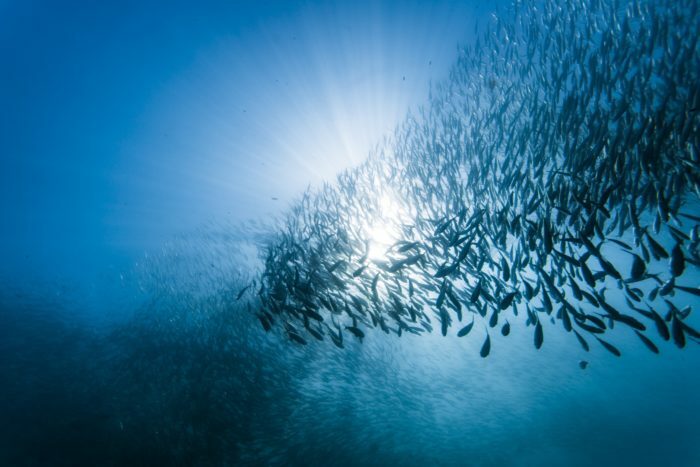 Every year, in June or July, to a greater or lesser extent, the giant schools of sardines, in shoals kilometers long, densely packed with silver fish, move north to Kei River just north of Port Alfred in KwaiZulu Natal. This massive food source brings in the fastest, biggest predators, Copper or Bronze Whaler sharks in huge numbers along with Ragged Tooth, Blacktip, Dusky, Tiger and Zambezi (Bull) and Great White sharks. There are also dolphins and orcas and bryde’s, humpback and minke whales. It is an all you can eat sardine buffet and the feeding is from above as well as below as the sea birds take their fill. On this dive trip based on the coast of Pondoland at Mbotyi River Lodge you hunt the shoals from a semi inflatable, aiming to get you in as close to the fish as possible. This is a “look there they are, let’s go!” activity. It is subject to weather, predator count and the vagaries of the natural world. There are long days at sea followed by Adrenalin pumping encounters with the shoals and the predators. It isn’t for everyone, but it is a chance to view one of the great natural migrations up close. Dive Level: PADI advance or higher with 100 logged dives necessary. Now the deepest indoor pool in the world diving Y-40 – The Deep Joy in Italy is a bizarre experience according to friends who combined a deep dive there with a trip to nearby Venice.Drive 45 minutes from Venice and the Y-40 is located in the Hotel Terme Millepine in the village of Montegrotto Terme. Measuring 21m x 18m on the surface and filled with 4300 cubic meters of thermal spa water the pool is held at a constant 32-34 °C. the pool, was designed by Emanuele Boaretto and has been built of 100 % Italian materials. The maximum depth is 40m (120ft) reached via a deep glowing almost clinical tube with a big 40 at the bottom. There isn’t much to see other than the numbers ticking up on your dive computer – friends registered the bottom at 42m which goes to show how much to trust your dive computer – but it is fascinating to dive so deep in such warm water with none of the familiar external signs that you are going down, down, deeper on down. Apart from the deep tube Y-40 offers an artificial cave system as well as various depths to teach all levels of scuba courses. An air walkway through the pool allows non-divers to watch and wave at divers and as a training ground for the national teams in swimming disciplines and freediver training there is always something fascinating to see. Diver’s to Y-40 use supplied kit so if you happen to be in the area and have nothing with you it is still accessible. Dive Level: entry does not require any certificate level and try dives are available along with courses. Dive guides are available for those without a buddy. Penguins are no fun – said nobody, ever. Everybody loves penguins and diving with them in the wild is an amazing experience. 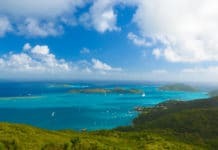 From South Africa to the Galapagos and Antarctica there are dive trips that offer this opportunity. The only place to dive with wild penguins in water that is relatively warm is at the Galapagos Islands (an epic dive trip in its own right). Although the water in the Humboldt Current is fairly cool at an average of 21 C (79 F) and a low of 16 C (60 F) it is still much warmer than temperatures in the Antarctic Ocean. The Galapagos Penguins is one of the smallest and cutest of the penguins. 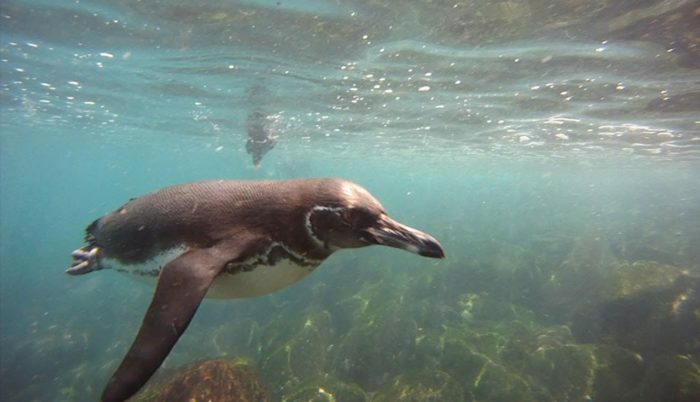 For beginners and novice divers, diving with the penguins is best done in Academy Bay. For the more advanced diver, the experience can be had at Bartolome Island. Unfortunately, the Galapagos Penguins are endangered, with only about 3000 remaining. In the 1980s and in 1998 El Niño caused a dent in the population but scientists monitor them regularly and the penguin numbers have been relatively stable for the last few years. If the far side of the world is too far to go to pick up a penguin – or watch it with respect – then Living Coasts, Torquay’s coastal zoo in the UK, offers a dive experience where people can come face-to-face with the charity’s penguins and other diving birds. The dive experience takes place first thing in the morning, when the penguins are at their most active. Guests will spend up to 45 minutes in the water with a qualified dive supervisor. The diver will have the chance to try cleaning windows, conduct a crab survey and take part in fun exercises. We’ll continue to countdown our top 10 in the next article, in the meantime if you have a favorite let us know in the comments below. Thanks for sharing! It will really help users to figure out best trips for them to use. Keep Sharing and helping the community.